Home | Events | Time to Spoil Mum! Mother’s Day is coming up next month and we want to help you spoil Mum, Grandma or your special Aunty like she really deserves! Scenario one: It’s the night before Mother’s Day and you’ve realised that tomorrow, the 12th of May (pop that in your calendar now, if it’s not already! ), is Mother’s Day. Panic sets in as you race to the supermarket. You locate a card (not many options left, but it will do) and then you start looking around for gift options. Your choices are: a box of chocolates, a generic “You’re the best Mum ever” mug or some slightly wilted flowers. Scenario two: It’s April (yep, a whole month early!) and you’re visiting your favourite dermaviduals clinic. 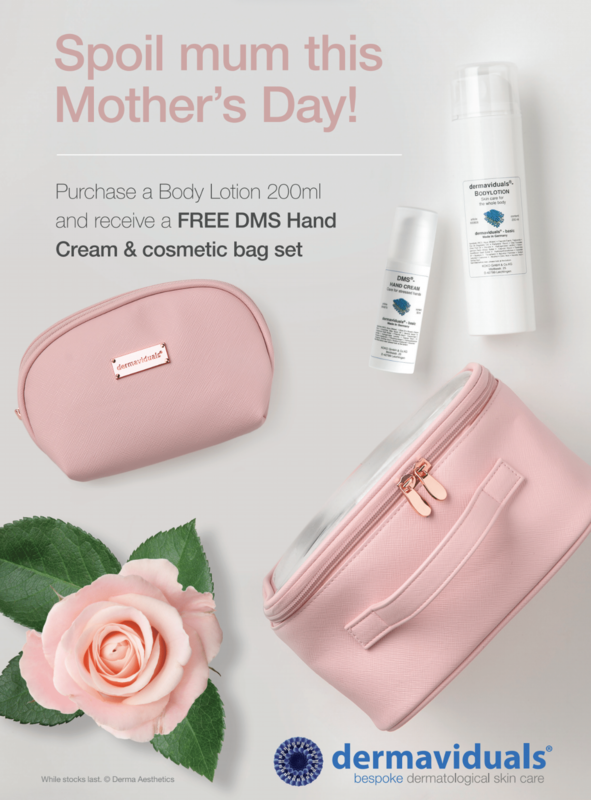 You spot our amazing April promotion, where if you purchase a DMS Body Lotion 200ml, you receive a FREE DMS Hand Cream 50ml and pink cosmetic bag set. “What a bargain”, you think to yourself as you put it on the counter. You head home knowing that Mum will love the gift of skin health (and a little luxury!). When you get home, patting yourself on the back for being so organised and thoughtful, you sit at your computer and create a customised card on a website such as MoonPig (no affiliation at all, but you can thank us later) using that amazing selfie of you both from your last family getaway. Why is our DMS Body Lotion different? It provides the skin with not only our famous Derma Membrane Structure but also Vitamin E, Olive Oil and Shea Butter. Learn more about DMS here. It has a strong smoothing effect on the skin without leaving an oily film and effects last for up to 72 hours. It is free from emulsifiers meaning there is no washout effect (a washout effect occurs when emulsifiers bind to water during showering and both the emulsifier and the skin’s natural lipids are washed away, leaving skin feeling dryer) when the client showers, hence its ability to increase hydration and encourage the regeneration of the skin’s cells. With the inclusion of Vitamin E, it is nourishing and provides elasticity. It is also particularly good for pregnant clients or clients prone to stretch marks. Most hand creams will leave hands feeling softer but if the product contains emulsifiers there will be a washout effect every time the hands are washed (washout effect explained above). It is specifically designed to protect hands from environmental influences and chapping. The addition of DMS stabilises the water balance allowing this product to be used on all forms of dryness and inflammation. It is a rich, nourishing cream with a non-greasy formula that does not leave a residue on the skin. It is regenerating and increases hydration. Besides spoiling Mum’s skin, how will you be celebrating on the 12th of May? Let us know in the comments below!